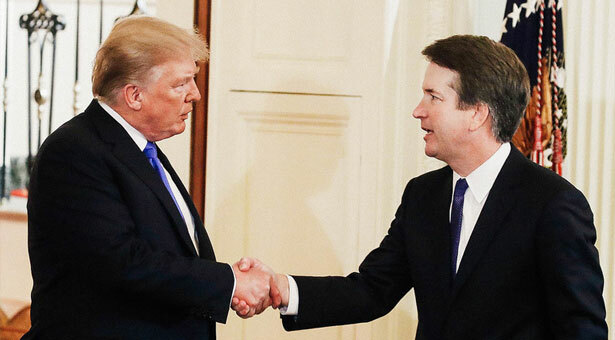 NEW YORK – The NAACP Legal Defense and Educational Fund, Inc. (LDF) today released an in-depth report analyzing the civil rights record of President Trump’s Supreme Court nominee, Judge Brett Kavanaugh, in advance of Kavanaugh’s nomination hearings, which are scheduled to begin next week. LDF opposes the confirmation of Judge Kavanaugh to the Supreme Court based on our detailed review of the limited available record of Judge Kavanaugh’s long career in public life and because of the unprecedented context in which this nomination arises. In addition to the growing cloud of suspicion surrounding this presidency, the Senate Republican majority is attempting to advance this confirmation process before large portions of Judge Kavanaugh’s record have been made public. The undisclosed documents are extremely relevant to assessing his qualifications and fitness to serve as a Supreme Court justice. Specifically, the documents relate to legal work he did as a public servant in the Executive Branch, a period which Kavanaugh himself has said was “the most interesting and informative” in preparing him for judicial service. Without these documents, it will be impossible for the Senate to responsibly and effectively evaluate this nominee and fulfill its Constitutional obligation to “advise and consent.” Yet, even with limited access to his full record, LDF has found cause for concern about Kavanaugh’s judicial values on matters of civil rights and racial justice. Dangerous Ideology.Judicial values matter. The nature of the docket of the D.C. Circuit Court of Appeals, where Judge Kavanaugh currently sits, has limited his opportunities to speak on some of the issues most important to LDF. Yet he has given us ample evidence of his ideology through his career and record to this point. It is clear, on close examination, that his judicial philosophy rests on the same philosophies that have led to disastrous civil-rights and racial-justice decisions in recent years. Executive Power.While allegations of potential grave misconduct surround the President, he has selected perhaps the greatest executive-power maximalist on the bench today in Judge Kavanaugh. On topic after topic Judge Kavanaugh has made clear that he believes in nearly unbridled Presidential power, and that he is willing to overturn long settled precedent to enact his views. Not only is this dangerous on its own, it’s a threat to civil rights any time they are perceived to conflict with executive power. Race Consciousness and Affirmative Action.Judge Kavanaugh’s work as a private lawyer for an anti-affirmative-action organization in a case challenging Hawaii’s right to remedy past discrimination against indigenous Hawaiians fits with what we discovered about his ideology. His confirmation would threaten governmental ability to use race to promote diversity and halt discrimination. Administrative Law.The technical area of administrative law has significant implications for our nation and for racial justice, as many administrative agencies work on issues bearing on racial justice every day. Judge Kavanaugh has radical, precedent-challenging views in this field that would limit agencies’ ability to work for the rights of Americans. In practice, he has also issued decisions that are dangerous for our environment. Access to Justice.The issue of who is permitted to have their day in court is fundamental to our system of justice. Judge Kavanaugh’s record is poor here—he shows special solicitude to well-heeled business interests’ need to defend their rights in court yet fails to appreciate the harms suffered by the less politically powerful. Criminal Justice.Judge Kavanaugh’s criminal justice record, with some exceptions, falls in line with the regressive criminal-justice record of Chief Justice William Rehnquist, who he has called his first judicial hero and whose criminal-justice jurisprudence he has praised at length. He shows nearly reflexive deference to assertions made by law enforcement and skepticism of the experience of people arrested for alleged crimes. Economic Justice.Our research indicates that Judge Kavanaugh could threaten the critical civil-rights theory of disparate impact, and that he has generally ruled against workers raising claims of employment discrimination and workers seeking to work together to protect their rights. Political Participation.Judge Kavanaugh upheld a restrictive voter ID law, giving short-shrift to evidence of racial discrimination, and has consistently hampered political participation by striking down campaign-finance laws that seek to ensure that money doesn’t drown out the voices of Americans without it. These and other concerns detailed in our report should compel the Senate to halt the scheduled hearings and suspend the confirmation process. Congress must take seriously its responsibility to offer advice and consent on judicial nominations by reviewing the nominees full and complete record, especially on the issue of civil rights. The Senate cannot do so without a complete record and should not do so under the unprecedented conditions of this embattled presidency. LDF encourages all Senators – Republican and Democrat alike – to review this report in detail and halt all further action on Judge Kavanaugh’s nomination.